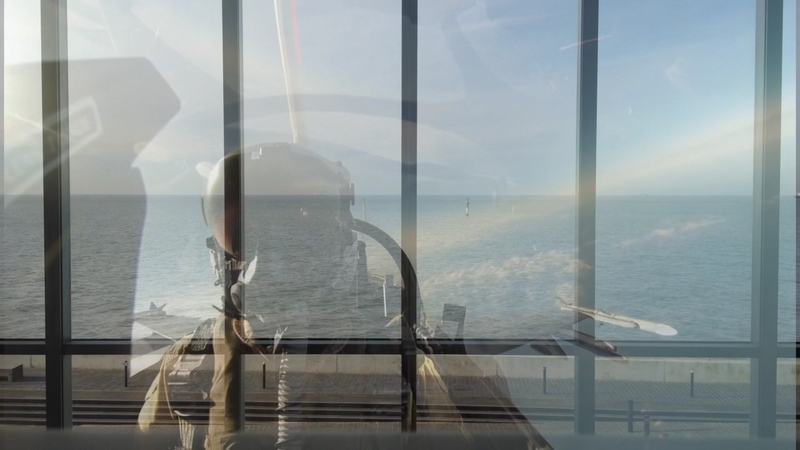 RGS-AC OA formerly Ocean Apocalypse using the vernacular of music video and corporate PowerPoint, cuts together footage of NATO Air Operations over the North Sea; the coastal launch of a Minuteman III ICBM; political mandarins associated with the Cold War; and the War on Terror with the fixed view of the North Sea through architect David Chipperfield’s Turner Contemporary in Margate. RGS-AC OA formerly Ocean Apocalypse shows that the North Sea remains a set for the performance and practice of geopolitical power projection and military demonstration, but also suggest these operations may exert covert influence upon the prosaic everyday. This work has been made as a part of a year long project in partnership with the Paper Studio Northumbria, The Northern Peripheries Research Network at Northumbria University, Berwick Visual Arts, South Shields Marine School, the School of Geography Politics and Sociology at Newcastle University and funded by Arts Council England. It investigates the obscured historic and contemporary geopolitical activities over, and looking out, across the North Sea.